Arsenolite: Mineral information, data and localities. For arsenic in the composition. This page provides mineralogical data about Arsenolite. 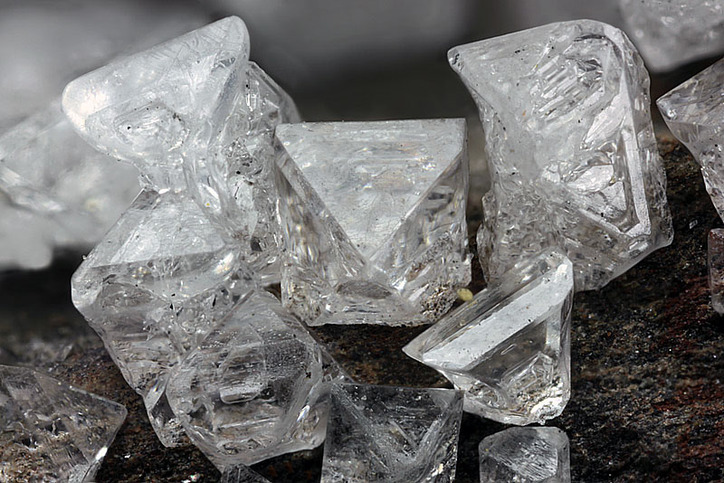 Commonly as tiny octahedra, sometimes modified by the dodecahedron; also in aggregates or crusts, botryoidal, stalactitic, earthy to pulverulent. Kenngottite (of Gagarin and Cuomo) A vitreous amorphous As2O3 which has not been shown to exist naturally. Arsenic 26 photos of Arsenolite associated with Arsenic on mindat.org. Kaatialaite 5 photos of Arsenolite associated with Kaatialaite on mindat.org. Realgar 5 photos of Arsenolite associated with Realgar on mindat.org. Claudetite 5 photos of Arsenolite associated with Claudetite on mindat.org. Scorodite 4 photos of Arsenolite associated with Scorodite on mindat.org. Calcite 4 photos of Arsenolite associated with Calcite on mindat.org. Quartz 3 photos of Arsenolite associated with Quartz on mindat.org. Stibarsen 3 photos of Arsenolite associated with Stibarsen on mindat.org. Galena 3 photos of Arsenolite associated with Galena on mindat.org. Pääkkönenite 3 photos of Arsenolite associated with Pääkkönenite on mindat.org. A highly toxic substance with an astringent, sweetish taste. Contains arsenic in a highly soluble form - always wash hands after handling. Avoid inhaling dust when handling or breaking. Never lick or ingest. Dana, J.D. (1854) II. Oxydes of elements of the arsenic group. I. Oxydes of arsenic, antimony, etc. Arsenolite. in A System of Mineralogy, Comprising the Most Recent Discoveries, Fourth Edition, Volume II, George P. Putnam & Co., New York and London, 139-140. Bozorth, R.M. (1923) The crystal structures of the cubic forms of arsenious and antimonous oxides. Journal of the American Chemical Society: 45: 1621-1627. Lihl, F. (1931) Präzisionsbestimmung der Gitterkonstante von As2O3. Zeitschrift für Kristallographie: 81: 142-147. Palache, C., Berman, H., Frondel, C. (1944) The System of Mineralogy of James Dwight Dana and Edward Salisbury Dana, Yale University 1837-1892, Volume I: Elements, Sulfides, Sulfosalts, Oxides. John Wiley and Sons, Inc. (New York), 7th edition, revised and enlarged, 543-544. Beattie, I.R., Livingston, K.M.S., Ozin, G.A., Reynolds, D.J. (1970) Single-crystal Raman spectra of arsenolite (As4O6) and senarmontite (Sb4O6). The gas-phase Raman spectra pf P4O6, P4O10, and As4O6. Journal of the Chemical Society A: Inorganic, Physical, Theoretical: 1970: 449-451. Flynn, E.J., Solin, S.A., Papatheodorou, G.N. (1976) Vibrational excitations of As2O3. II. Crystalline phases. Physical Review B: 13: 1752-1758. Mrose, M.E., Larson, R.R., Estep, P.A. (1976) Forbesite — a mixture of cobaltoan annabergite and arsenolite. The Canadian Mineralogist: 14: 414-421. Pertlik, F. (1978) Structure refinement of cubic As2O3 (arsenolite) with single crystal data. Czechoslovak Journal of Physics: B28(2): 170-176. Chemical Abstracts: 88: 573 [abstract]. Treacy, D.J., Taylor, P.C. (1981) Nuclear quadrupole resonance in two crystalline forms of As2O3, arsenolite and claudetite. International Solid State Communications: 40(2): 135-138. Anthony, J.W. et al. (1997) Handbook of Mineralogy, Vol. 3, 24. Grzechnik, A. (1999) Compressibility and vibrational modes in solid As4O6. Journal of Solid State Chemistry: 144: 416-422. Ballirano, P., Maras, A. (2002) Refinement of the crystal structure of arsenolite, As2O3. Zeitschrift für Kristallographie: 217: 177-178. Gilliam, S.J., Merrow, C.N., Kirkby, S.J., Jensen, J.O., Zeroka, D., Banerjee, A. (2003) Raman spectroscopy of arsenolite: crystalline cubic As4O6. Journal of Solid State Chemistry: 173: 54-58. Soignard, E., Amin, S.A., Mei, Q., Benmore, C.J., Yarger, J.L. (2008) High-pressure behavior of As2O3: Amorphous-amorphous and crystalline-amorphous transitions. Physical Review B: 77: 144113-8. Ballirano, P. (2012) Thermal behavior of realgar As4S4, and of arsenolite As2O3 and non-stoichiometric As8S8+x crystals produced from As4S4 melt recrystallization. American Mineralogist: 97: 1320-1329. The following Arsenolite specimens are currently listed for sale on minfind.com. Ashley, P.M. & Lottermoser, B. G. (1999): Arsenic contamination at the Mole River mine, northern New South Wales. Australian Journal of Earth Sciences, 46, 861-874. Hebbard, E.R., Wilson, S.A., Jowitt, S.M., Tait, A.W., Turvey, C.C., Wilson, H.L. (2017): Regrowth of arsenate-sulfate efflorescences on processing plant walls at the Ottery arsenic-tin mine, New South Wales, Australia: Implications for arsenic mobility and remediation of mineral processing sites. Applied Geochemistry 79, 91-106. Meixner, H. (1950): Contributions to Mineralogy and Petrology 2(3), 195-209. A. Strasser: Die Minerale Salzburgs (1989); Pribitzer, F. (1956): Die Minerallagerstätte Zinkwand bei Schladming in Steiermark (Österreich). Aufschluss, 7 (3), 59-63. Loeber, A. (2005). "La carrière de Hourt, Grand Halleux, Province de Luxembourg, Belgique." Magazine du 4M, 26(255), 5-7; Dehove, J. and Hubert, F. (2006). "Nouvelles découvertes à Hourt." Magazine du 4M, 27(263), 9-11. Anthony, J. W. et al. (1997): Handbook of Mineralogy, Vol. 3, 24; Traill, R. J. (1980) Catalog of Canadian Minerals: Revised 1980. Geological Survey of Canada Paper 80-18. Sabina, Ann P., 1987. Rocks and Minerals for the Collector: Hull-Maniwaki, Quebec; Ottawa-Peterborough, Ontario, Geological Survey of Canada,Miscellaneous Report 41, 141 p.
Palache, C., Berman, H., & Frondel, C. (1951), The System of Mineralogy of James Dwight Dana and Edward Salisbury Dana, Yale University 1837-1892, Volume II: 711; Yale Peabody Museum collection #701, #702.
samples analysed by Anthony Kampf, Curator Emeritus of Mineral Sciences at NHM of LAC, California; Kampf, A.R., Nash, B.P., Dini, M., Molina Donoso, A.A. (2016): Chongite, Ca3Mg2(AsO4)2(AsO3OH)2·4H2O, a new arsenate member of the hureaulite group from the Torrecillas mine, Iquique Province, Chile. Mineralogical Magazine, 80, (in press). Zhiwei Bao (2001): Thesis, University of Québec, Canada. Acta Mineral. Sinica: 21(3):271-277, in Chinese, English abs. Zhu, X., Wang, R., Lu, X., Liu, H., Li, J., Ouyang, B., Lu, J. (2015): Secondary minerals of weathered orpiment-realgar-bearing tailings in Shimen carbonate-type realgar mine, Changde, Central China. Mineral. Petrol. 109, 1-15. ; Roth, P., Raber, T., Favreau, G. and Meisser, N. (2017): Thallium Sulfosalts from the Shimen As-Deposit, Hunan, China. Mineral Up 4(6): 8-22. Ondruš, P. & Hyršl, J. (1989): New finds and revision of secondary minerals from Příbram district. Acta Universitatis Carolinae, Geologica 1989, 521-533. Kašpar, P., Řídkošil, T., Šrein, V.: Minerogeneze žíly T 1 z Třebska u Příbrami. Acta Universitatis Carolinae – Geologica, 1983, vol. 27, nos. 1-2, s. 61-96. Žáček, V., Ondruš, P.: Mineralogy of recently formed sublimates from Kateřina colliery in Radvanice, Eastern Bohemia, Czech Republic. Bulletin of the Czech geological survey, 1998, vol. 73, no. 2, s. 289-302. Sehrig, M. & Dietel, J. (2011): Silber, Uran, Arsen und Heilquellen: Auf Mineraliensuche in Jáchymov, einem der ältesten Bergwerke der Welt. Lapis 36 (7-8), 67-71; 86. Plašil J, Sejkora J, Ondruš P, Veselovský F, Beran P, Goliáš V (2006): Supergene minerals in the Horní Slavkov uranium ore district, Czech Republic. Journal of the Czech Geological Society 51, 149-158. Pauliš, P., Říha, V.: Arzenolit z Měděnce v Krušných horách. Časopis pro mineralogii a geologii, 1990, roč. 35, č. 4, s. 429. Bouška, V., Dvořák, Z.: Nerosty severočeské hěndouhelné pánve. Praha: Severočeské doly, a.s., 160 s.
Raade et al. (1984): Kaatialaite, a new ferric arsenate mineral from Finland. American Mineralogist. 69, 383-387; Makitie, H., Karkkainen, N., Lahti, S. I., & Alviola, R. (2001). Compositional variation of granitic pegmatites in relation to regional metamorphism in the Seinajoki region, western Finland. Special Paper 30 - Geological Survey of Finland, 31-59. Laurent, H. (1995) - Minéralisations des houillères embrasées, Le Règne Minéral,(2), 41-45. Wittern, Journée: "Mineralien finden in den Vogesen", von Loga (Cologne), 1997; U. Kolitsch (1997): Neufunde von Mineralien aus einigen Vorkommen der Vogesen, Frankreich: Giromagny, Auxelles-Haut und Kruth 1. Aufschluss 48 (4), 243-256. Blaß, G. & Graf, H.W. (2000): Neufunde von bekannten Fundorten im Schwarzwald. Mineralien-Welt, 11 (4), 57-60. Schnorrer-Köhler, G. (1991): Mineralogische Notizen V. Aufschluss 42, 155-171. Schnorrer, G. (2000): Mineralogische Notizen VII. Der Aufschluss, 51, 281-293. SCHNORRER, G. (1995): Mineralogische Neuheiten von bekannten deutschen Fundorten. Lapis 20 (12), 43-48; 62. Tröger, S. (2012): Der Steinbruch Reimersgrün im Sächsischen Vogtland. Lapis 37 (10), 32-39. Craw, D., & Bowell, R. J. (2014). The characterization of arsenic in mine waste. Reviews in Mineralogy and Geochemistry, 79(1), 473-505. Bowell, R. J. (1994). Sulfide oxidation and production of gossans, Ashanti mine, Ghana. International Geology Review, 36(8), 732-752. Meixner, H. & Paar, W. (1982): New observations on ore formation and weathering of the Kamariza deposit, Laurion, SE Attica (Greece). Special Publication of the Society for Geology Applied to Mineral Deposits 2 (Ore Genesis: State of the Art), 760-767. Blaß, G., Fabritz, K. H., Mühlbauer, W. and Prachar, I. (1998): … Immer wieder Neues aus Lavrion (2). Mineralien-Welt 9 (6), 48-55 (in German). de Haller, series of article in Bull. Soc. Genevoise de Minéralogie in the 1980s. ; Morrissey, C. J. (1970) The Mineralogy, Structure and Origin of the Lead-zinc-copper Residual Orebody at Tynagh, County Gamay, Ireland (Doctoral dissertation, Imperial College of Science and Technology London). ⓘ Solfatara di Pozzuoli ? 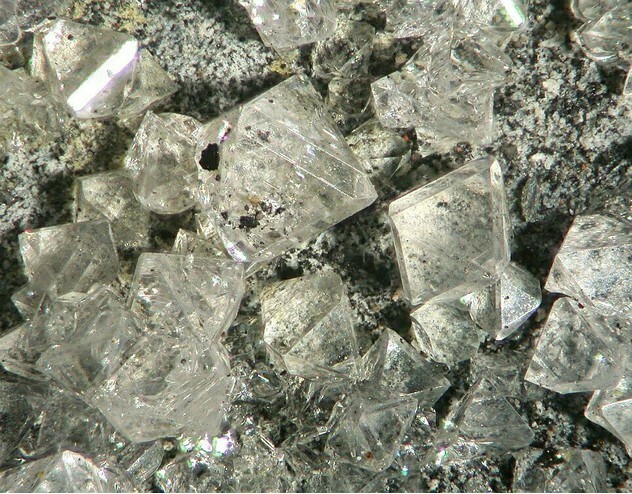 - Russo, M., Campostrini, I., Demartin, F. (2017): I minerali di origine fumarolica dei Campi Flegrei: Solfatara di Pozzuoli (Napoli) e dintorni. Micro, 15, 122-192. Bortolozzi, G.M., Ponton, M., Vidus, L. and Zucchini, R. (2017) Affioramento metallifero ad arseniati e solfati a debole radioattività: Rio Spinal da Ciare (Cercivento, Udine). Gortania, 39, 79-97. Piccoli G.C., Maletto G., Bosio P., Lombardo B. (2007). Minerali del Piemonte e della Valle d'Aosta. Associazione Amici del Museo "F. Eusebio" di Alba, Ed., Alba (Cuneo), 607 pp. Anthony, J. W. et al. (1997): Handbook of Mineralogy, Vol. 3, 24; Ambrino, P., Blass, G., Boscardin, M., Ciriotti, M.E., Dalla Fontana, G., Kolitsch, U., Martini, B., Milli, L., Salvetti, A., Bonacina, E. (2008). Borgofranco d'Ivrea. La paragenesi a solfuri e solfosali delle miniere argentifere. Rivista Mineralogica Italiana, 3/2008, 144-162; Campostrini, I., Demartin, F., Martini, B., Salvetti, A., Dalla Fontana, G., Boscardin, M., Ambrino, P., Ciriotti, M.E. (2014): Villyaellenite dalle gallerie inferiori di Biò, Borgofranco d’Ivrea (Torino), Piemonte. GMT 2014 Giornate Mineralogiche di Tavagnasco, 6-8 giugno 2014. Plinius, 40, 170. Stara P., Rizzo R. and Tanca G.A. (1996): Iglesiente e Arburese. Miniere e minerali. Vol. II (pagg. 192). EMSa 1996. Stara, P., Rizzo, R., Tanca, G.A. (1996): Iglesiente e Arburese. Miniere e Minerali. Edito a cura dell'EMSA e "varie associazioni mineralogiche", Volume 2°, 239 pp. 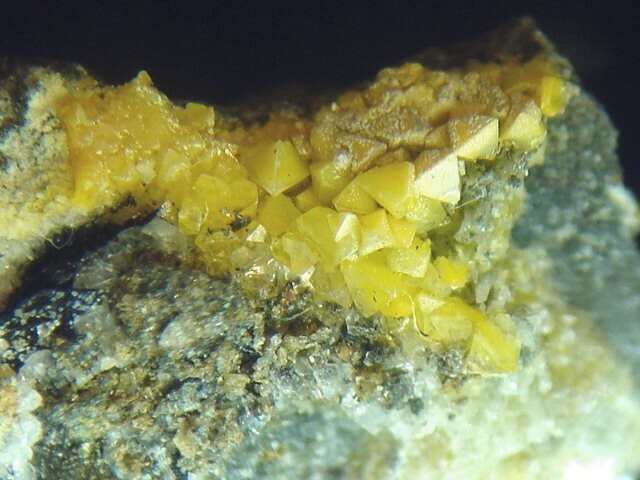 Garavelli, A., Mitolo, D., Pinto, D., Vurro, F. (2013): Lucabindiite, (K,NH4)As4O6(Cl,Br), a new fumarole mineral from the "La Fossa" crater at Vulcano, Aeolian Islands, Italy. American Mineralogist, 98, 470–477. Percival, T. J., Radtke, A. S., & Bagby, W. C. (1990). Relationships among carbonate-replacement gold deposits, gold Skarns, and intrusive rocks, Bau Mining District, Sarawak, Malaysia. Mining Geology, 40(219), 1-16. Wolfram Dieter Schuh (1993) Geology, Geochemistry, And Ore Deposits Of The Bau Gold Mining District, Sarawak, Malaysia. PhD Thesis University of Arizona. Breward, N., & Williams, M. (1994). Preliminary Apparaisal of the Environmental Geochemistry of the Bau Mining Area, Sarawak, Malaysia. British Geological Survey. Siuda, R.: Złoże Stara Góra. Otoczak, vol. 26, p. 2-12. Pekov I.V. et al. (2010) Mineralogy of Belorechenskoe deposit (Northern Caucasus, Russia). Mineralogical Almanakh, 15(2). ; Pekov, I.V., Levitskiy, V.V., Krivovichev, S.V., Zolotarev, A.A., Bryzgalov, I.A., Zadov, A.E. & Chukanov, N.V. (2012): New nickel-uranium-arsenic mineral species from the oxidation zone of the Belorechenskoye deposit, Northern Caucasus, Russia: I. Rauchite, Ni(UO2)2(AsO4)2.10H2O, a member of the autunite group. European Journal of Mineralogy, 24, 913-922. Yakovenchuk, V.N., Pakhomovsky, Ya.A., Konoplyova, N.G., Panikorovskii, T.L., Mikhailova, Yu.A., Bocharov, V.N., Krivovichev, S.V., Ivanyuk, G.Yu. (2017): Epifanovite, NaCaCu5(PO4)4[AsO2(OH)2]·7H2O a new mineral from the Këster deposit (Sakha-Yakutia, Russia). Zapiski RMO, 146(3), 30-38.; Yakovenchuk, V. N., Pakhomovsky, Y. A., Konopleva, N. G., Panikorovskii, T. L., Bazai, A., Mikhailova, J. A., ... & Krivovichev, S. V. (2018). Batagayite, CaZn 2 (Zn, Cu) 6 (PO 4) 4 (PO 3 OH) 3· 12H 2 O, a new phosphate mineral from Këster tin deposit (Yakutia, Russia): occurrence and crystal structure. Mineralogy and Petrology, 1-11. Vertushkov, G.N. [Вертушков, Г.Н.] (1938): Arsenolite from the Blagodatnyi mines in the Urals [Арсенолит из Благодатных рудников на Урале]. Zapiski Vsesoyuznogo Mineralogicheskogo Obshchestva [Записки Всесоюзного Минералогического Общества], 67, 3, 488 (in Russian). Slobodan A. Radosavljević, Jovica N. Stojanović, Ana S. Radosavljević-Mihajlović, Vladan D. Kašić (2013): Polymetallic mineralization of the Boranja orefield, Podrinje Metallogenic District, Serbia: zonality, mineral associations and genetic features. Periodico di Mineralogia, 82, 61-87. Koděra, M. a kol. : Topografická mineralogie Slovenska. Sv. 3 Sed-Ž, Bratislava, Veda 1990, s. 1273-5. Melczer G., 1907: Gömörmegye ásványai. In: Eisele: Gömör és Borsód vármegyék bányászati és kohászati monografiája. Selmeczbánya, 521-546 (in Hungarian). Calvo, M. (2009): Minerales y Minas de España. Vol. IV, Óxidos e Hidróxidos. Escuela Técnica Superior de Ingenieros de Minas de Madrid - Fundación Gómez Pardo. 752 pp. Viñals, J.,Bareche,E.y Coca, J. (1990) Mines de Catalunya, Vimbodí (II).Mineralogistes de Catalunya, 4, 213-227. Betterton, J. (2000) Famous Mineral Localities: Penberthy Croft Mine, St. Hilary, Cornwall, England. UK Journal of Mines & Minerals, 20, 7-37. Mineralogical Magazine 1965 34 : 159-176.
von Knorring, O., and Condliffe, E. (1984) On the occurrence of niobium-tantalum and other rare-element minerals in the Meldon aplite, Devonshire. Mineralogical Magazine, vol. 48, n° 348, 443-448. Anthony, J.W., et al (1995), Mineralogy of Arizona, 3rd.ed. : 120. Hanks, Henry Garber (1884), Fourth report of the State Mineralogist: California Mining Bureau. Report 4, 410 pp. (includes catalog of minerals of California pp. 63-410), and miscellaneous observations on mineral products): 311; Murdoch, Joseph & Robert W. Webb (1966), Minerals of California, Centennial Volume (1866-1966): California Division Mines & Geology Bulletin 189: 85, 318; Palache, C., Berman, H. & Frondel, C. (1944), The System of Mineralogy of James Dwight Dana and Edward Salisbury Dana, Yale University 1837-1892, 7th. edition, Volume I: 543. Hanks, Henry Garber (1884), Fourth report of the State Mineralogist: California Mining Bureau. Report 4, 410 pp. (includes catalog of minerals of California pp. 63-410), and miscellaneous observations on mineral products): 76; Palache, Charles, Harry Berman & Clifford Frondel (1944), The System of Mineralogy of James Dwight Dana and Edward Salisbury Dana Yale University 1837-1892, Volume I. John Wiley and Sons, Inc., New York. 7th edition, revised and enlarged, 834pp. : 543; Mineralogical Record 20 129-142. Morgan, V. and Erd, R.C. (1969) Minerals of the Kramer borate district, California California Division of Mines and Geology Mineral Information Service: 22(9): 147; Carnahan, V. (1970), Notes on some minerals from Boron: Bulletin of the Mineralogical Society of Southern California, November: 10; Pemberton, H. Earl (1983), Minerals of California; Van Nostrand Reinholt Press: 186. Blake, Wm. P. (1866), Annotated catalogue of the principal mineral species hitherto recognized n California and the adjoining states and territories; being a report of the California State Board of Agriculture. 31 pp., Sacramento: 8; Blake, Wm. P. (1897), Gold in granite and plutonic rocks: A.I.M.E. Transactions 1896: 26: 292; Palache, C., Berman, H. & Frondel, C. (1944), The System of Mineralogy of James Dwight Dana and Edward Salisbury Dana, Yale University 1837-1892, Volume I: Elements, Sulfides, Sulfosalts, Oxides. John Wiley and Sons, Inc., New York. 7th edition, revised and enlarged, 834pp. : 543; Murdoch, Joseph & Robert W. Webb (1966), Minerals of California, Centennial Volume (1866-1966): California Division Mines & Geology Bulletin 189: 85. Landon, Robert Emmanuel (1927), Roemerite from California: American Mineralogist: 12: 279-283; Murdoch, Joseph & Robert W. Webb (1966), Minerals of California, Centennial Volume (1866-1966): California Division Mines & Geology Bulletin 189: 85. Eckel, E. B. (1997): Minerals of Colorado. [Updated and revised edition]. Fulcrum Publishing. 665 pages. ⓘ Great Hill cobalt mines ? ⓘ State Forest Quarry #2 (State Forest No. 2 Mica Mine) ? ⓘ State Farm Quarry (Road Metal Quarry) ? Schooner, Richard. (circa 1980s), Untitled manuscript on central Connecticut mineralogy. ⓘ Strickland Quarry (Eureka Quarry) ? Schooner, Richard. (1955): 90 Minerals from 1 Connecticut Hill. Rocks & Minerals: 30(7-8): 351-8. Mineralogy associated with burning Anthracite deposits of Eastern Pennsylvania, D. M. Lapham, J. H. Barns, W. Downey Jr. and R. B. Finkelman, Min. Rescs. Report #78, 1980; Dunn, P. J., Peacor, D. R., Criddle, A. J. and Finkelman, R. B. (1986): Laphamite, an arsenic selenide analogue of orpiment, from burning anthracite deposits in Pennsylvania. Mineralogical Magazine, 50, 279-282. Rocks & Minerals: 67(6): 380-388.